Chicago style was developed by the University of Chicago Press and is used extensively in History, Art History, and other disciplines. Chicago and Turabian do allow in-text citation like APA and MLA, but traditionally call for footnotes (at the bottom of a page) or endnotes (at the end of the work) instead. What is Turabian style? Is it different from Chicago? Chicago style was designed originally for book publishers. Turabian re-interprets it for scholarly papers. They are essentially the same, but there are minor differences. Check with your instructor about which version you should use. Chicago Manual of Style Description of this database. These are the official guides to Chicago and Turabian styles. Style guides can be difficult to work with at times. If you have any questions, Ask a Librarian – we're here to help! – or check one of the websites or videos below. They provide summaries and simplified explanations. The official reference for Chicago style, published by the University of Chicago Press. The latest edition is in Reference, with some previous editions in Circulation. We also have the 2017 edition as an e-book: Use it online! 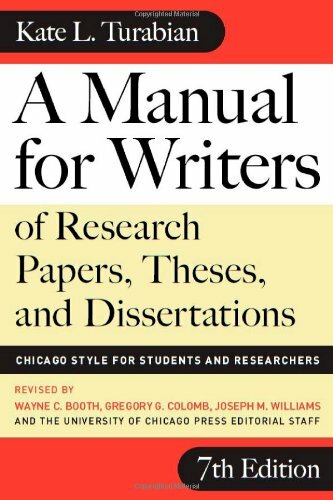 Based on (and almost identical to) the Chicago style guide, but intended specifically for student use. Learn about Chicago style in this guide, published by Purdue University's Online Writing Lab. A quick but helpful overview and cheat sheet for Chicago style.